The United States and China are getting closer to a full-blown trade war. President Trump imposed new tariffs on about $200 billion of Chinese goods and threatened to add billions more in an attempt to force the country to change its trade practices, which he says, “plainly constitute a grave threat to the long-term health and prosperity of the United Sates economy.” The 10% tax on imports from China take effect today and will rise to 25% at the end of the year. Chinese authorities have gotten creative in their efforts to control the fall in the Shanghai and Shenzhen stock markets, which recently experienced their steepest one-day plunge in more than eight years. Prohibiting large shareholders and executives from selling their stocks, as announced last month, was a bold step, as was providing central-bank money to brokerage firms for equity purchases. Shutting down a large part of the markets was perhaps the most brazen move, as regulators allowed more than half of all listed companies to suspend trading in their shares. It’s little surprise that Communist China would tamper with its own stock markets. Of more concern: Since the 2008 financial crisis, free-market principles in most developed markets, including the U.S. and Europe, have come under attack by governments and central banks bent on buoying asset prices and easing the pain of often necessary market discipline. Since 2008 the Federal Reserve, the European Central Bank, the People’s Bank of China, the Bank of Japan and the Bank of England have all cut their interest rates drastically. While these lower rates have supported consumption, they have primarily benefited financial assets, which have rallied for six years with only rare corrections…. Governments increased public spending through fiscal stimulus plans, while central banks implemented aggressive quantitative-easing programs, which translated into colossal purchases of financial assets. Since 2008 the combined balance sheets of the world’s five leading central banks have increased by a staggering $9 trillion. July’s near “Grexit” from the eurozone has revived the debate of austerity versus supposedly growth-friendly policies. Austerity-bashers have found in this latest episode of the Greek crisis new reasons to criticize the so-called troika of international creditors—the European Commission, the International Monetary Fund and the European Central Bank—and Germany in particular for its stance against providing more bailout funds to Greece without meaningful concessions. Greece is depicted as an innocent victim of the eurozone’s economic and fiscal tyranny. So a country that has borrowed astronomical amounts of money, stubbornly resisted crucial reforms, repeatedly missed its budget-deficit targets, and likely manipulated its fiscal numbers is called a victim? A country that is now in the process of being bailed out for the third time in five years, a victim? Meanwhile, the coldhearted “austerians” aren’t only accused of being substantively wrong, but also of pursuing hidden or purely ideological agendas, such as slashing social programs or making the rich richer. More people need to question the antiausterity camp’s real motives, which clearly stem from a distrust of markets. This is especially obvious when their attacks on fiscal discipline ignore the progress made by countries where austerity measures have been successfully implemented, such as the United Kingdom, Ireland or Portugal. Do these fiscal doves care that much about unemployed Spaniards or Greek pensioners? Perhaps, but their ultimate goal, it seems, is to ensure that extraordinary postcrisis measures become permanent policy. Those who oppose this merely want a gradual return to normal fiscal and monetary policies. Austerity is just another word for free market, and the harsh debate around it is actually about whether the economy should operate freely again, or continue to drift toward a state-driven model. Unprecedented monetary easing, high public spending, repressive regulation and automatic debt forgiveness, while arguably useful in the midst of a severe crisis, cannot be sustainable remedies in the long term—that is unless one believes the world should do away with free-market principles altogether. Those who continue to advocate such measures, more than seven years after the global financial crisis blew up, should at least admit that what they really want is a profound and permanent change in the system. Maybe they know something I don’t, but it is fair to ask whether these extreme interventionist policies have become part of the problem rather than the solution, and if we shouldn’t instead revert to what remains the most successful economic system ever tried—the free market. As far as the U.S. and its slow but steady drift away from market fundamentals is concerned, the Federal Reserve’s future interest-rate decisions and the coming presidential election will provide important clues as to where the nation, and its still unsteady economy, is headed. Mr. Hatchuel is managing partner of Square Advisors LLC, a New York-based asset-management firm. Policy makers and financial pundits insist that the risk of the Federal Reserve raising rates too early exceeds that of moving too late. The Fed appears to agree. In recent years, the Fed has repeatedly moved its goal posts, seemingly to avoid raising the federal-funds rate from near zero. But is the prevailing consensus correct if emergency economic conditions are long past? Comparisons with 1937 or with Japan in the 1990s are commonly used as examples of mistakes to avoid. Both occasions were preceded by a severe financial crisis, and years later monetary policy was prematurely tightened. The differences between the current policy conjuncture and these historical analogues are striking, however. Eight years after the 1929 crash, consumer prices in the U.S. had fallen by a cumulative 18% and unemployment remained above 14%. And in Japan today prices are still down relative to their pre-banking crisis levels. …Near-zero rates during and in the years after 2008 no doubt helped end the so-called Great Recession. But the U.S. economy is no longer under emergency conditions or facing the perils of 1937. Why then does it require emergency monetary policy? While inflation targeting gave no warning of what was to come in 2008, why is inflation moving from 1.5% to 2% a necessary condition for raising rates from the current emergency levels? Even models that the Fed used to justify quantitative easing (QE) in recent years are today pointing to rates well above 1%. Why now use new, untested theories to justify zero? ….QE has ushered in a new sense of power by central banks. Yet monetary policy has limitations. It is mostly well-suited to filling in temporary shortfalls in demand. Except for exceptional conditions, it borrows growth from the future. The Fed seems all-too-convinced that this is a trade-off worth making. With unemployment at 10%, history was likely on their side. At a 5.5% unemployment rate, it fails the test of history and common sense. May the risk-reward of too early versus too late prevailing in policy circles be backward? Mr. Broda is a managing director at Duquesne Capital Management. Mr. Druckenmiller was the founder of Duquesne Capital and is the CEO of the Duquesne Family Office. Four companies comprise the ‘household products’ industry within the S&P 500 Index. They are long standing, high quality enterprises whose products we use every day. The four companies are Procter & Gamble, Clorox, Kimberly – Clark and Colgate-Palmolive. Understandably, investors have recently been seeking reliable companies paying consistent dividends, and franchises such as the four in the household products industry fit that bill. But as often becomes the case, the markets desire for too much of one thing can leave better value elsewhere. Take a basket of four ‘old’ technology companies for example and let’s compare a few items briefly. Using Microsoft, Intel, Texas Instruments and Cisco Systems as a comparative basket of stocks, it is interesting to see that investors may be able to get significantly better values, while still get what they are looking for on the dividend front. Yes, this is simply a ‘snap-shot’ of these stocks and there are many items to consider. But a few things here are clear – earnings and cash flows can be purchased significantly cheaper in the old tech basket than the household products group currently – over 30% cheaper – and nothing is given up in the form of current income. In fact, the old tech group pays almost 15% more current income, in addition to growing that dividend income at a faster pace the last five years. Finally, there are many ways to measure ‘quality’, but one measure is most certainly debt, and on that metric as well the old tech basket laps the currently very popular household products. Somewhat buried beneath the surface of the highly imperfect fiscal cliff package voted on this week was some good news for dividend investors. Dividend tax rates for individuals making less than $400,000 per year and households earning less than $450,000 remain at 15%, while those making over those amounts will be taxed at 20%. Even considering the higher 20% number, there are some significant positives to take. First of all, this rate is now permanent (meaning not set to expire), making it likely to be in effect for some time and at a significantly lower level than many believed would be adopted. Secondly, this rate is low by historical standards, as dividend taxes have been higher than 20% in 42 of the last 51 years, and for those that pay 15% this remains the single lowest rate dividends have been taxed in at least a half century. Finally, this tax rate is equivalent with the capital gains tax and the level playing field between the two should have positive ramifications for dividend investors as corporate management decides how to allocate cash flows. For many years before 2003 capital gains had preferential treatment to dividends but that temporarily ended with the Bush tax cuts that were set to expire on New Years Eve. Wisely this level playing field was made a permanent feature. – The above tax rates exclude a new 3.8% surtax on investment income as a result of ObamaCare subsidies for private health insurance and expansion of Medicaid. This looks to impact individuals making more than $200,000 a year or couples with $250,000 or more, and applies to all forms of income from investments, apparently even including profits from a home sale. Typing ‘fiscal cliff’ in Google search currently returns 630 million references! Nationally (and internationally) it is clear our attention is focused intently on lawmakers in Washington D.C. and what they will do with pending automatic tax increases and spending cuts due to take effect at the start of the new year. As investors we need to prepare for the likelihood of a debate that will be all too public and filled with rancor, likely resulting in a fair amount of volatile price action for stocks. As news is incrementally digested over the course of the next month or so, there will be days filled with gloom and despair and other days that may offer some hope. In either case, we need to focus on what matters – and outside of an outrageously unexpected result, it ultimately won’t matter much over an investment time horizon what does get decided in Washington. It might to a trader, but not to an investor. We are not trying to convey a tax increase as a positive development, but it’s extremely important to keep it in perspective. Dividends have accounted for a huge part of the stock market’s total return for many, many decades. In addition, dividend paying stocks have a long record of outperforming non-payers, and have done so even in periods of oppressive tax regimes. The table below illustrates the performance disparity between dividend growers, constant dividend payers, non-payers and cutters over the period from 1972 to June of 2011. Initially, one might think that periods of very high dividend tax rates (particularly relative to capital gains) would cause investors to gravitate away from dividend paying stocks – but that is not what has happened. In the time frame cited above, dividend tax rates exceeded 38.5% exactly two thirds of the time, with an astounding top rate of 70% levied for a full 10 years of the analysis period! What’s more, the average difference between the rate on dividends and capital gains was vast, with capital gains spending 82% of the time at a maximum rate of 28% or under – but often significantly below that. Investors who are worried that a rise in dividend taxes will be commensurately larger than capital gains taxes – and therefore seek to avoid significant dividend payers – may end up being thoroughly surprised by the eventual performance outcome. Morningstar looked at 100 years of tax rates on dividends compared to capital gains and termed the spread between the two the ‘dividend tax penalty’. In an environment where a large spread exists, we might conclude that corporate management would opt not to pay out a high portion of earnings (referred to as the payout ratio), but this has not been the historical case. In decades where the ‘penalty’ was highest – in the range around 60% – the three year average payout ratio hovered well above half of all profits being distributed through dividends. Compare this to the last nine years, when the penalty has been 0% (no difference between capital gains and dividend taxes) and yet payout ratios have resided near the historical nadir of roughly 35%. In other words there has been no correlation between a high ‘dividend tax penalty’, and the inclination of management to reduce commitments to dividends through lower payout ratios. Just recently Goldman Sachs issued a report estimating dividend growth for the S&P500 to be 11% in 2013, even after assuming a dividend tax increase into the 25% range. If dividend taxes rise further that may tilt some return of cash to shareholders via share buybacks, but would still result in additional growth of dividend income over current levels. Also, most American investors hold a significant portion of their stocks in tax deferred accounts such as Individual Retirement Accounts, both Traditional and Roth, and 401(k) accounts. Frequent reports estimate the percentage of stock holdings in all forms of these tax deferred portfolios to be greater than 60% to 65% of all equity ownership. Given that no tax is paid on investment income earned while inside of these accounts, a change in dividend tax rates has no direct impact. We clearly don’t prefer to see tax increases on investment income, but even if tax burdens do rise, dividends will continue to supply substantial, durable and growing streams of income. We would rather capture a dollar up front, taxed at prevailing rates, than receive the promise of capital gains we may never get the opportunity to pay taxes on. Bonds, already taxed at ordinary income rates, cannot provide growth of income, and at today’s rates they hardly even provide interest. Stocks that do not pay dividends provide neither income nor predictable capital gains. With the added support of demographic trends and the absence of material income from bonds, we believe investors will continue to seek consistent dividend payers. It is worth repeating the characteristics we seek in the companies we want our clients to own, terming it QDG: Quality, Durability and Growth. Generally businesses fail or are at risk due to some combination of intense competition, low returns on capital and unmanageable debt levels. Additionally complacency and/or arrogance manifest’s itself in insufficient attention to the balance sheet when times are good – in turn putting the enterprise at risk when times aren’t so good. As these are the characteristics often associated with failure, we look to turn that around and focus on Quality franchises with very strong competitive positions (often global leaders in their industries), with consistently high returns on capital, favorable gearing ratios (debt to capital levels) and other important marks of balance sheet attention. Identifying the Durability and Growth of dividend income are key steps in finding those companies that not only survive the turbulent times but thrive in the next phase. We look for a history of dividend payment through market cycles, an identifiable, established and committed dividend culture or one that is making a rapid and decisive conversion to an attractive dividend payer. Strong cash flow and prospects for earnings growth to support payout growth is crucial. We would rather accept a lower yield that consistently grows, than stretch for a higher yield we believe may not be sustainable. Ultimately we believe a portfolio of quality companies with durable and growing dividend payments – where we’re treated as an owner, sharing in the profits consistently on a cash basis – has the opportunity to produce attractive risk-adjusted returns. The successful application of our dividend growth strategy has never solely been a function of low tax rates, as the intrinsic advantages of durable dividends have allowed shareowners to prosper through a wide variety of tax environments. We don’t see any reason why that should change. Investors have been paying up for ‘defense’. This is reflected in many ways, probably the most obvious being the demand for US Treasury notes. With the current yield on a 10 year note at 1.57%, the implied negative real rate of return is fairly clear evidence of the payment for defense and the flight to safety (or perceived safety). There’s also some evidence within the equity markets of this mentality as well. Take the utility sector for instance, which according to Thomson Reuters Baseline has traded at an average P/E discount to the SP500 of 20% over the last two decades, but now hovers at a 10% premium to the market – it’s peak relative valuation over that span. Risk averse investors are seeking as much certainty as possible, and these generally stable businesses with nice dividends have attracted a lot of attention. This attention however has resulted in valuation levels that do not appear as attractive as they have at other periods, and yields have shrunk as a result. Though a good case can be made that high quality businesses with stable and high dividends deserve a certain level of premium, investors need to consider other factors, such as growth of that yield when determining the appropriate price to pay for a stock. 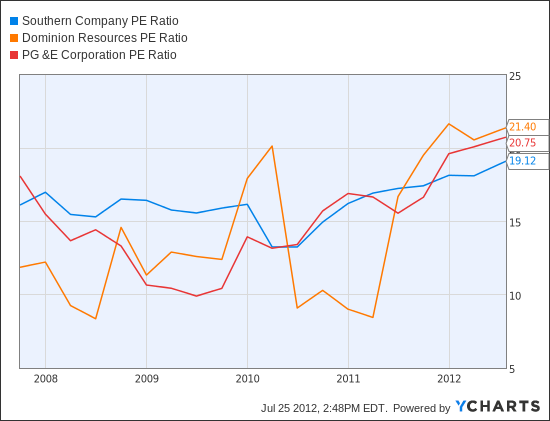 Below is a chart of the P/E ratios for a few of the top holdings in the Utilities Select Sector SPDR (XLU). The market as a whole trades under 15x earnings, so these multiples illustrate the current premium for ‘defense’. The issue for investors who may have large allocations to this sector is that from current levels, the defense may not end up being as hardy as hoped. Apple is en fuego. The company blew out their latest quarterly report, issued last night, and analysts on average see the company making $45.50 per share in earnings for fiscal 2012. Five years ago Apple earned $3.93 per share. That’s over 1,000% earnings growth in 5 short years, or 63% compounded annual growth. Utterly remarkable. What is also remarkable is the extent to which Apple’s stock is having an impact on the direction of stock indices. Take the Nasdaq 100 for instance, which includes 100 of the largest domestic and international non-financial securities listed on The Nasdaq Stock Market. Because it’s a market capitalization weighted index (like most) Apple now makes up 19% of the index due to its current value. Today alone the stock accounted for just shy of 60% of the Index’s 2.68% return! Analyzed on a year to date basis, without Apple’s contribution, the index would need to lop off almost 40% of its return. Investors need to be very aware of the distortions this can create when using indices for comparisons sake, and though it may have been beneficial recently to ‘index investors’, without the ability to control the level of exposure, unknown risks are created, only to become apparent later. In other words, those that live by the sword may end up dying by the sword. The link below is to a 3 minute satirical short film called Debt Limit – A Guide to American Federal Debt Made Easy. Putting our national debt into perspective, the video examines how it would apply pro-rata to just one family. In its own way the point is highlighted that we have tough choices to make, and the sooner the better. It is worth the 3 minutes. As we reflect on a prosperous 2011 for our dividend growth stocks, we want to express heartfelt thanksgiving to our wonderful clients and financial partners. We are humbled and excited to wake up each morning and serve those that have entrusted us with their capital. It is a sincere privilege. Happy New Year! Italy’s new government unveiled austerity measures today in an attempt to begin dealing with serious debt issues that plague the country. The bond market in Italy, which is one of the world’s largest, has been in turmoil recently amid rising borrowing costs as investors flee – becoming a threat to Italy and the Euro as a whole. That bond market saw some relief today with hopes high it will last more than temporarily. To Italy’s credit they now are upfront about the issues they face and the need to deal with them. “Italians are to blame for our public debt, and we risk compromising everything we’ve accomplished in the last 60 years”, Prime Minister Mario Monti told a news conference. He also stated he will not accept a salary as premier and economy minister. In announcing pension overhauls which were part of the plan Labor Minister Elsa Fornero broke down in tears, saying the changes were necessary to avoid “collective impoverishment”. The pain of this reality is reflected in the photo of her below courtesy of AP/Wall Street Journal. Unfortunately this is the reality the world faces and is symbolic of the many future steps needed by the world’s developed nations. But, while there are many things to learn from MF Global, the idea that “capitalism failed” is not one of them. There is, of course, the lesson that serving customers and earning money the hard way is the best way to create wealth…making proprietary bets to try and “strike it rich” is not. The idea that someone understands the market better than the market itself is an age old business problem, created and supported by blind ego. This problem – ego – has taken down companies before and it will take down companies again. It’s not special to Wall Street, it happens in everyday life. It’s human. It happens on Main Street, it happens at home with the kids, it happens on the sports field. It’s life. Capitalism deals with this fact of life very well. Winners (those who operate with integrity and wisdom and read the needs of customers well) accumulate more assets. Losers (those who try to cut corners, cheat people or misunderstand customers) have assets taken away from them. There are always exceptions to the rule, but as time marches on, assets flow toward those who use them best. Jon Corzine made bets on government… This is understandable in a way. Jon Corzine has been in government, not the private sector, for the past decade. He was a US Senator from, and Governor of, New Jersey. Moreover, his former employer (Goldman Sachs) and probably many of the hedge fund types who traded and cleared through MF Global often base trading strategies on policy moves by the Fed, the US Treasury, the ECB, and other sovereign governments. This is a widespread practice these days. Macro-trading, based on government policy moves has become the go-to spot for trillions of dollars of capital. This can be a dangerous strategy as MF Global, and many others, have found. Investors who want to build wealth over time would be better served by trusting in capitalism and buying assets that are attached to thriving businesses that serve customers well and make profits the old fashioned way. Capitalism works. Today as the market prepared to open and stock index futures were pointing to a lower open on continued Greek shenanigans, the financial news network CNBC was playing background music as they panned the floor of the New York Stock Exchange heading to a commercial break. The tune was Steve Miller’s popular song from the ‘70’s ‘Take the Money and Run’. At another time we might discuss at a deeper level the merits of the news network’s subliminal messaging, but in short order it is yet another example of the continued short cycle, trading mentality of our stock market culture today. As we have discussed in previous blog posts as well as our most recent quarterly Point of View, titled Motion Sickness located under our resources tab, this short cycle view of investing can be very dangerous to most investors’ financial health. Along these lines we recently ran across a very short but salient video by Bill Ackman, a successful hedge fund manager. We believe this two minute introduction video to a longer lecture encapsulates some key thoughts about the psychology of investing that may be worth revisiting again. U.S. corporations have a higher share of cash on their balance sheets than at any point in almost a half century, the Federal Reserve reported on September 16th. Businesses appear to be building up buffers rather than hiring or investing in new plants. Non-financial companies held more than $2 trillion in cash and other liquid assets as of the end of June, up more than $88 billion from the end of the first quarter of this year. Cash accounted for 7.1% of all company assets (everything from hard assets to investments) which is the highest level in 48 years. The figures released by the Federal Reserve do not take into account the additional and substantial cash reserves held at many U.S. companies’ foreign subsidiaries – which would be taxed if repatriated to the United States. These figures are continued evidence of the healthy financial position of Corporate America. Ultimately this has positive implications for the U.S. economy, but in the immediate term, it is confirmation that the Fed’s intended consequence of low interest rates – to spur riskier pursuits like investment and hiring – is not yet playing out. Some news out of Intel (INTC) last week caught our attention. The company issued $5 billion of 5, 10 and 30 year bonds in its first sale of non-convertible debt in 24 years. The 5 year note yielded 1.95%, the 10 year note 3.3% and the 30 year bonds 4.8%. Intel does not need to borrow the money; they reported having $4.64 billion in cash and only $2.09 billion of long term debt in their latest quarterly filing. They also produced an astounding $17.1 billion in cash flow over the trailing four quarters. But if investors are willing to gobble up the notes, why wouldn’t they borrow at those rates? This news hints at several things to us, but primarily it’s evidence of the continued discrepancy in our mind between the valuation of many high quality stocks versus the valuation of bonds. Intel’s common stock on the day they floated the debt deal yielded 4% (almost a percent higher than the 10 year fixed note they issued and double the rate on the same maturity issued by the US Treasury), it traded at 9 times forward earnings, produced an internal cash flow yield in relation to it’s enterprise value of almost 17% and sported a return on equity over 25%. Very importantly the dividend is not fixed. Intel has been growing it at 14% over the last 5 years and likely will continue to grow it into the future given its cash flow prowess and statements issued by company officials. But in this market where fear appears the overriding emotion, many flock to the bonds and not the high quality stocks of companies that issue them. If an investor buys and holds the 10 year note, the best return they can make is the 3.3% coupon – and that does not factor in inflation. While acknowledging a higher level of risk than the bond holder, give us 10 years with a high quality company rapidly growing a durable dividend while purchased at this valuation and we believe the return has potential far beyond the bond holder’s coupon, while potentially hedging us to some degree against inflation and compensating us for the added risk. By the way the company stated they will use the borrowings to repurchase stock, which normally we aren’t big fans of companies doing, but in Intel’s case it appears wise based in part on the valuation metrics cited above. 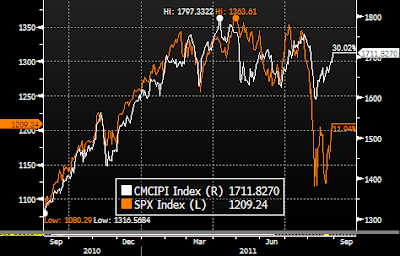 “This chart compares Bloomberg’s Constant Maturity Commodity Index (white line) to the S&P 500 Index (orange line). From last November through April, these two indices were almost perfectly correlated, suggesting that both were reacting to the same economic growth fundamentals. The correlation broke down over the past month or two, however, as equities were overcome by fears that a collapse of the Eurozone banking system could have serious repercussions for the global economy. Commodities initially shared in the onset of panic, but have since bounced back, and today are trading a little above their average for the year to date. The stock market has had a rough couple of weeks, and the volatility might continue for awhile. The uncertainty over Congress pushing the debt ceiling debate to the 11th hour and some less than stellar economic reports (possibly exacerbated by the Washington induced uncertainty) has made for some stomach churning days. Couple those ingredients with a time of year often associated with some of the least favorable historical returns and the combination can make us all fret. But try not to let it. These are not conditions that should make us alter our long term strategies. It is true we as a country have some serious fiscal issues that need to be addressed – as does a good portion of the developed world- and our quarterly Point of View we sent out in April acknowledged and tried to address that issue. There is a quote we have heard in the past that is timely and accurate – “Investing in an uncertain world is the only certainty”. This rings very true – as from almost every juncture in history we can pull a litany of items from the time that seemed destined to alter the investing landscape. Very few do however when viewed in the context of someone’s long term needs and goals for their money. From our viewpoint it is vitally important for us as investors to focus on the kinds of qualities and characteristics we just discussed in our July Point of View letter. It may also be helpful to remember the fundamental underpinnings and some current data points of our Core Dividend strategy. Currently produces an average weighted equity yield of 3.81% as of 8/2/11. The companies producing this income are very high quality multinational enterprises with balance sheets much healthier than the countries in which they live. Their income will help offer long term support and ultimately growth in their prices. The companies in our portfolio have grown their dividend income at almost 12% per year for the last 5 years, which includes during the depths of the financial crisis. This growing income stream is vital for us as investors and ultimately is not ignored by the market. The prices of these stocks, as demonstrated by an average PE multiple of under 12x, which is well below historical market averages, may also offer support and possibly significant opportunity. To date, the stock market has noticed these kinds of attributes as we continue to outperform the market YTD as demand has grown for these types of companies. We will always go through these periods of time; it is a fact of life for any investor. The S&P 500 has only had one year in the last 30 years where the largest pullback didn’t exceed 5% and 17 of those 30 years produced one or more pullbacks exceeding double digits. We need to use these times to stick with (and add) to those franchises that continue to pay us handsome dividend income while we wait out those volatile periods, and that ultimately drive their prices forward over the intermediate and long term.